Jew Food 101: Bialys | Dylan Cooks. 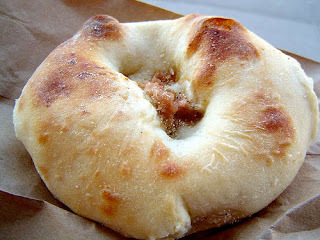 It’s a bialy, it’s real, and it’s from Kossar’s. One of the foods that Jews are probably best known for is the bagel. A giant circle of dough with a hole in it, the bagel has become a staple breakfast food for millions of Americans. However, I think most people would be shocked to find out that, for Jews, the bagel is actually not our favorite breakfast food. Go into New York and ask any Jew what their preferable grab-and-go morning meal of choice is, and you’re most likely going to get the same answer: a bialy. So, just what is a bialy? If you were to shrink the size of a bagel significantly, make it flatter, plug the hole and fill it with a bit of onion, you would have a bialy. There are a lot of imitators out there, mostly consisting of bagel shops placing circular flatbread covered with onions in their shop windows and labeling it as a bialy. Do not be deceived. If it doesn’t look like the above picture, chances are it’s a crappy copycat. The taste is almost impossible to describe, but it’s got a wonderfully chewy, flour-dusted texture that makes it sort of incomparable to any other food. Whenever I’m in New York City (usually quite a few times throughout the year), I always make it a point to make a trip to the Lower East Side and stop at Kossar’s Bialy’s, one of the only true bakeries left in the country that knows what a real bialy is. $0.90 will get you one of these delectable treats, and I can assure you that it’ll be the best-spent 90 cents of your life. Of course, don’t go on Saturday, because as a true Jewish establishment, Kossar’s simply doesn’t roll on Shabbos. Now, for those of you in the Madison area, rumor has it (from reliable sources) that there’s a bakery on the East Side that actually makes real bialys, but only on the weekends. I’ll be investigating the Manna Cafe & Bakery this Saturday to see if those rumors are true, and will be sure to report back with whatever I find. Now, here’s my message to all you bagel-eating goys that are trying their hardest to emulate my people: EAT A BIALY. It’s the first in a long line of steps to becoming a true, stereotypical Jew. Thanks! This is the Vigilante theme, which is free. If you google “Vigilante” and “WordPress,” you should be able to find it. Excuse me young man but Bubbie Pearl, a first-generation Eastern European Brooklyn Jew, says that a real bialy does not have any onion. There are onion rolls, but they do not use bialy dough. However, Grandma Pearl, a second-generation Eastern European Brooklyn Jew, says there is, in fact, a little bit of “fuzzy onion” in the middle. Upon further investigation, it appears that Bubbie grew up in Brownsville and Grandma grew up in Flatbush. So, perhaps there were some variations depending on what part of Russia the baker was from.